This is the title of a great, great essay by Bruce Bartlett in The American Conservative, who tells about “My life on the Republican right—and how I saw it all go wrong.” No selected passages or money quotes here (there would be too many). Just read the essay. The whole thing, from beginning to end. You won’t regret it. Just one thing. In Bartlett’s quote in the above photo, he says the Republican party today wants anarchy and ending government. This is not precisely the case and his own essay implicitly says why. What comes across in his account is the extreme intolerance of today’s Republicans for anyone who doesn’t share their world-view. If these people were to control all three branches of government—with a solid conservative majority on the Supreme Court and a filibuster-proof Senate—they would not only gut the welfare state—and, via SCOTUS rulings, render impossible its future revival—but also the institutions of democracy, notably in undermining the suffrage via an abrogation of the Voting Rights Act. Significant portions of the (Democratic-voting) electorate would be effectively disenfranchised (the efforts at voter suppression in Florida, Ohio, and other states in the last election give an inkling as to GOP intentions on this; see also the proposal by Republican office holders in Ohio and Pennsylvania to implement the congressional district method in the allocation of electoral votes). Representation is distorted enough in America as it is, but the Republicans, if they could, would distort it even further, attempting to lock in their control over the reins of power for generations, and despite the demographic evolution of American society. Under unchecked Republican rule, America would be a brutal and violent place, and with an increasingly muscular repressive state apparatus. So-called small government conservatives only believe in small government when it comes to transfer payments and regulations on business, not on the powers of the police and instruments of repression. Thank God Obama won. And that he won decisively. a phenomenon I notice a lot on the right (you can see it often in the comments on this blog): the persistent portrayal of people who disagree with them as marginal figures with trivial support. I think of Bill O’Reilly dismissing anyone who presents data he doesn’t like as “far left”, even when they’re thoroughly mainstream. Or, to be self-centered, the constant insistence by some people that nobody pays attention to what yours truly says; there are, it appears, an awful lot of nobodies out there. I’m not sure I fully understand this phenomenon, but it comes in part from a refusal to pay any attention at all to what other people think. The point isn’t just that right-wingers believe in their own reality, but that they don’t think it matters that other people have different versions of reality. And no, this isn’t symmetric: liberals don’t consider it unnecessary to know what conservatives are thinking, or dismiss actually influential figures as marginal. Liberal may despise Rush Limbaugh, but they won’t dismiss him as a marginal figure nobody listens to. This is so true. À propos, some three years ago I was “informed” by a Tea Party interlocutor from the American Midwest that Paul Krugman was “a joke” and that “nobody” paid any attention to him, “not even liberals.” For my brilliant interlocutor I was ergo a “nobody,” as were the millions who read Krugman regularly. Lots of us nobodies out there (and who continue to feel oh so good about the results of the election; how nice it is to know that we are, in fact, not only not nobodies but the majority…). 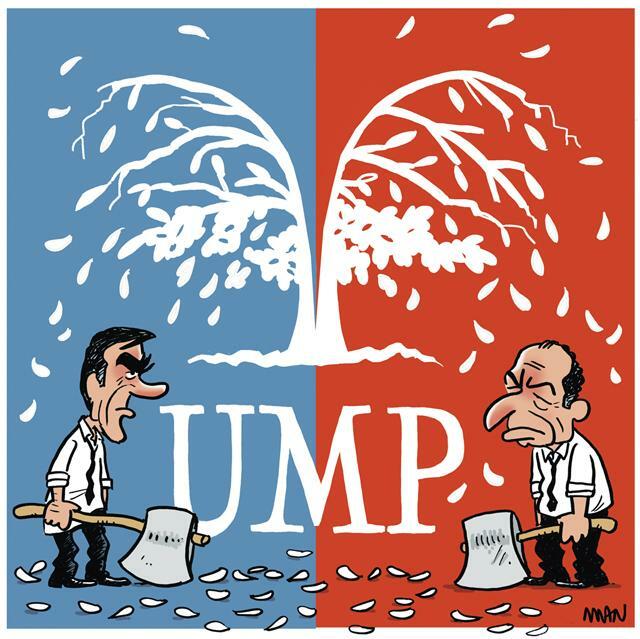 La guerre fratricide continue au sein de l’UMP. Ça va durer, on dirait. À ce sujet je trouve pertinent et juste l’éditorial du Monde, “Tourner la page du sarkozysme,” dans le numéro daté le 25-26 novembre (probablement rédigé par le directeur du journal, Erik Izraelewicz, qui est subitement décédé hier). La crise qui déchire l’UMP ne survient pas par hasard. Certes, elle est déclenchée par les scores équivalents qu’ont obtenus ses candidats à la présidence, François Fillon et Jean-François Copé. Certes, elle est le fruit d’ambitions individuelles féroces, mais la rupture s’explique par une division idéologique profonde au sein du parti conservateur. Elle trouve même ses racines dans la schizophrénie d’une grande partie des dirigeants de la droite, qui ne parviennent pas à conjuguer leur éthique et leurs ambitions personnelles. Ainsi, Jean-François Copé, qui inventa le drame des enfants se faisant voler leur pain au chocolat pour ne pas avoir observé le jeûne du ramadan, passe pour l’héritier radical de Nicolas Sarkozy. Il incarne moins une résurgence néogaulliste du RPR de Jacques Chirac qu’un retour des jeunes loups de l’ancien Parti républicain, libéraux et droitiers. Mais M. Copé a fait équipe avec celui qui osa en premier émettre des critiques publiques contre la droitisation de la campagne de Nicolas Sarkozy en 2012 : Jean-Pierre Raffarin. Les libéraux centristes, comme l’ancien premier ministre Raffarin ou l’ex-ministre de l’éducation Luc Châtel, ont rejoint M. Copé, pour reconquérir le pouvoir. Ils savaient que leur champion devrait ménager une large place à un pôle centriste pour rassembler toute la droite. Ce faisant, ils n’ont pas mené l’indispensable clarification idéologique. L’équipe de François Fillon apparaît plus traditionnelle, plus provinciale, plus consensuelle. L’unique premier ministre de Nicolas Sarkozy se présente comme un orthodoxe en économie, un modéré sur les sujets de société. Mais celui qui se disait dès 2007 “à la tête d’un Etat en faillite” n’a jamais eu le courage de claquer la porte de Matignon en raison du laxisme budgétaire de Nicolas Sarkozy, ou pour protester contre la dérive sécuritaire, évidente depuis l’été 2010 avec le discours de Grenoble sur les Roms et la déchéance de la nationalité des assassins de policiers. François Fillon est bloqué au centre par l’UDI de Jean-Louis Borloo. “Nous sommes en train de devenir l’écurie présidentielle du Front national ou de Jean-Louis Borloo. Au choix”, a résumé l’ancien ministre de l’agriculture Bruno Le Maire, qui n’a pas choisi entre M. Fillon et M. Copé. Le péril sera encore plus grand pour la droite si François Hollande continue de s’affranchir de son aile gauche et instille une dose de proportionnelle aux législatives, rendant possible une alliance au centre. Nicolas Sarkozy n’est pas le grand gagnant de cette guerre fratricide. Il en est la cause. C’est lui qui a franchi, lors de sa campagne présidentielle pour 2012, les bornes de la droite fréquentable. Nicolas Sarkozy, faux retraité de la politique, est présenté comme un recours. C’est oublier l’équation qui fit son succès en 2007. Il était parvenu à réconcilier le centre et la droite populaire. Mais il a échoué, se montrant incapable de réaliser la rupture promise, tandis que son tempérament, qui a crispé toute la société française, l’a disqualifié. Nicolas Sarkozy n’a guère plus de chances de revenir, durablement et avec succès, dans la course que n’en avait son adversaire de 2007, Ségolène Royal. Si elle veut se reconstruire, l’UMP doit commencer par un inventaire sérieux des années Sarkozy et une redéfinition de valeurs communes. Copé et Fillon sont cuits tous les deux, ce qui est plutôt évident. Et Sarkozy ne reviendra certainement pas dans l’arène politique, ce qui est évident aussi. Pour la prochaine élection présidentielle il faudra que le candidat de l’UMP soit un troisième (ou quatrième) homme. François Baroin, peut-être ? You heard it here first. Krugman is not alone in his confusion. The philosophical touchstone of contemporary German economics isn’t the work of Adam Smith, or Hayek, or Marx, but rather Walter Euken, a man whom few outside of Germany have ever heard of (though he’s so well-regarded in his own country that his face has appeared on a German stamp). In the 1930s, Euken founded a school of economics at the University of Freiburg that came to be known as ordoliberalism. It combined a commitment to free markets with a belief in strong government, but its primary economic concern was stability—understandable in a country scarred by the experience of hyperinflation in the 1920s, the depression of the 1930s, and the subsequent rise of Nazism. When West Germany needed to create a state in the aftermath of World War II, the ordoliberal theoreticians set up the “social market economy” that became the country’s unquestioned economic framework. They created a robust welfare state, but it was embedded in a legal structure that was engineered to promote economic stability—rules for balanced budgets, rules for labor participation in the workplace—and ideally wouldn’t require continuous intervention by the state. I have no doubt come across Walter Euken’s name but can’t say I know much about him. As I’ll be teaching a new course next semester on the EU, I’ll read up on him and ‘ordoliberalism’, which is a compelling model. 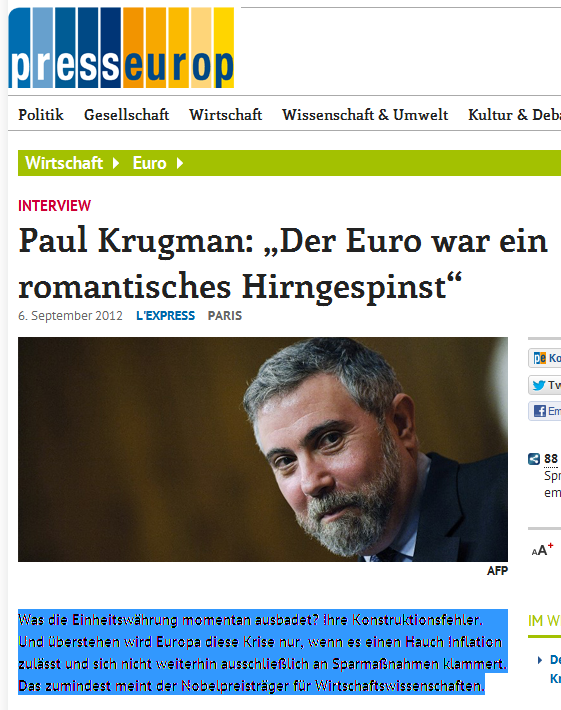 In the meantime, I will continue to side with my man Krugman on Germany and Europe, though, as does he, I do like Germany and have a lot of admiration for it and for Germans. It is a well-ordered, civilized, prosperous country (and not for cultural reasons; Germans do not work harder and are no more efficient than Frenchmen). It’s the ordoliberalism, stupid! 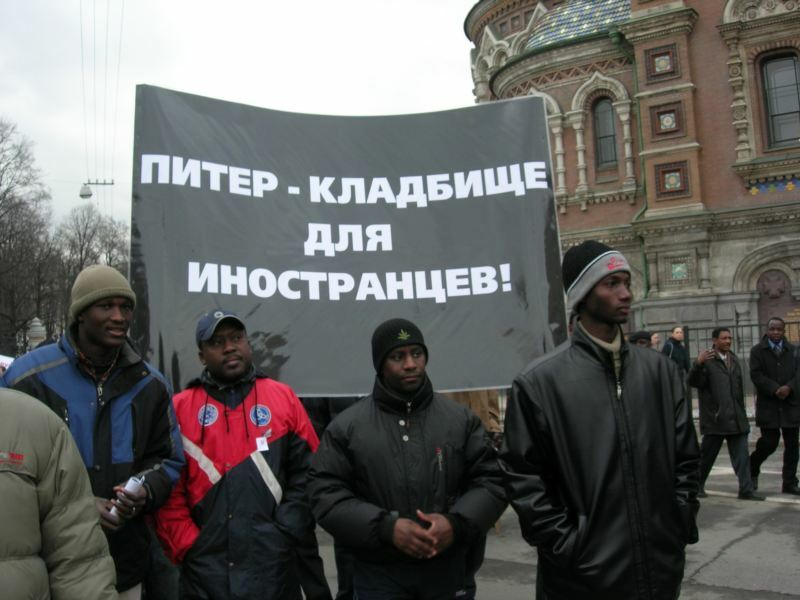 Is it racist to call Russians racist? 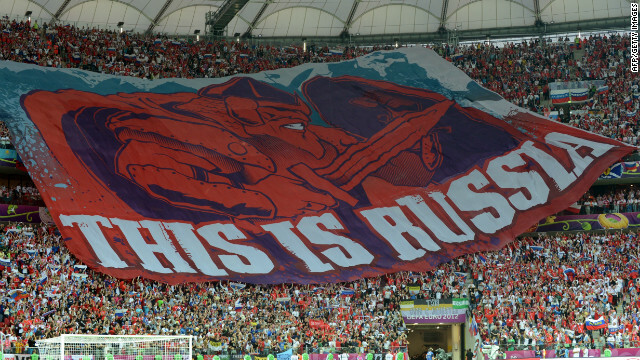 I have no hesitation in saying that I find Russia a dangerous and frightening country. Any country where neo-Nazi gangs can roam the streets in the heart of the capital city and murder dark-skinned people with impunity, with the tacit approval of the citizenry and the police looking the other way, has serious mental problems. And then there’s Vladimir Putin, so hugely popular until only recently. I have written as much in recent months on AWAV (go to the Russia/ex-USSR category and see the ‘Elena’ and ‘Russia: Mafia state’ posts). This reminded me of an op-ed in Haaretz from earlier this month, on Russians in Israel and racism, which I kept. Here it is. Notable passages are highlighted in bold. The author is a historian at Hebrew University. Given his name, one would assume he has intimate, personal knowledge of the phenomenon, i.e. that he knows of what he speaks. Since Barack Obama was elected president, one of the most popular jokes in Putin’s Russia is: “Obama’s election as president – the black humor of Americans.” Would it be racist to argue that a cultural group which embraces such a joke is a group characterized by clear racist tendencies? Since Barack Obama was elected president of the United States in 2008, one of the most popular jokes in Putin’s Russia – and its cultural diaspora around the world, including in Israel – is: “Obama’s election as president – the black humor of Americans.” The question is: Would it be racist to argue that a cultural group which embraces such a joke is a group characterized by clear racist tendencies or would such an argument in fact be anti-racist, since it diagnoses a worrying trend of racism among a population with a shared past of sorts? Such a question could also be asked of Meretz chairwoman Zahava Gal-On’s comparison between Yisrael Beiteinu’s leader, Foreign Minister Avigdor Lieberman, and Russia’s leader, President Vladimir Putin. Would it be racist to postulate that there is some common denominator between two politicians who come from a single country that no longer exists, who rose to greatness thanks in no small part to the former citizens of that country, and who have both demonstrated loyalty to that country’s tradition of suppressing civil rights? Or perhaps the opposite is the case; maybe such a theory demonstrates the post-Soviet phenomenon of racism in a broad context. The Soviet state carried out an unprecedented human experiment. On the one hand, the concepts of enlightenment and equality, morality, human dignity and human freedom flooded the public space ad nauseam. On the other hand, in the absence of an open society and without any possibility of public oversight, the most despicable of human drives were awakened and ran wild. All you need to do is see the tormentors in the somewhat subversive Soviet movies from the end of the Soviet era to get an impression of the extent of the social Darwinism, the deification of belligerence in relations between groups and individuals, and the contempt for the different and the weak – categories that included many Soviet citizens in the 1970s and ’80s. Those who did not live in the Soviet Union of that era, or have not researched it thoroughly, will find it difficult to imagine the low point to which the ethics governing civil and political life plummeted as the result of that experimentation. The inconceivable gap between the rhetoric of civil and national equality and the reality of social Darwinism gone crazy and institutional discrimination on the basis of ethnic origin caused many Soviet citizens to see the concepts of enlightenment, humanism and equality as the culprits. They thought the ideas themselves, rather than those who corrupted them, were inherently false and hypocritical. And so the average native Israeli is wrong to say, as Ari Shavit did in his opinion piece last week, that “the immigrants from Russia sought to escape a tyrannical political culture and not replicate it.” Most Lieberman voters, like most Putin voters in Russia, want to live in a country that will not make use of the corrupted version of equality and humanism and that will not, even for the sake of appearances, futilely fight discrimination among various groups, since they see such discrimination as the legitimate expression of human nature. Putin voters in today’s Russia have, in large part, succeeded in fulfilling this political and social vision. Lieberman voters in Israel are likely to do so in the near future. As such, a comparison between Putin and Lieberman is not racist. On the contrary, it is an expression of the protest against a wave of post-Soviet racism, on the part of those who do not want a joke like “Obama’s election as president – the black humor of Americans” to take root in Israel as well. The bombings, it will be recalled, were blamed on Chechen rebels and used as a pretext for Boris Yeltsin’s Kremlin to launch a bloody second war against Chechnya, a republic in the Russian Federation. They also were crucial events in promoting Vladimir Putin’s takeover of the Russian presidency as Yeltsin’s anointed successor in 2000 and in ensuring his dominance over the Russian political scene ever since. Dunlop, a senior fellow at the Hoover Institution, seeks in his book to provide the “spade work” for an official Russian inquiry, if it ever were to be initiated (a highly doubtful proposition as long as Putin remains in power). He draws on investigative reporting by Russian journalists, accounts of Russian officials in law enforcement agencies, eyewitness testimony, and the analyses of Western journalists and academics. The evidence he provides makes an overwhelming case that Russian authorities were complicit in these horrific attacks. Knight’s review, which is entitled “Finally, We Know About the Moscow Bombings,” is a must read for those wishing to understand the workings of power in Russia, of the us et coutumes of the men who run that country—and always have—, not to mention their level of morality and consideration for human life. One consequence of the 1999 bombings that Knight does not get into, as it is outside the scope of her essay, was the upsurge in violent racist attacks against Chechens—and against Caucasians and Central Asians more generally—across Russia. Not that virulent racism against the large migrant communities from the ex-Soviet periphery hadn’t existed before, but it became that much more so. 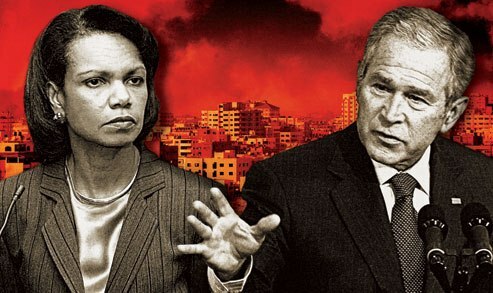 Apart from a few isolated incidents there was no such reaction to Arabs in the US after 9/11. Knight’s essay is behind the NYRB’s paywall but may be read in full here. ADDENDUM: On the Chenchen conflict, see the review essay in the 24 September 1998 NYRB (the only one of the numerous NYRB articles on the subject not behind the paywall), “Chechnya: How Russia Lost,” by then Moscow correspondent Robert Cottrell. Ce matin encore, l’UMP et l’image que ce parti donne de la politique. C’est l’image de ce qu’il y a de plus détestable en politique : la triche, les manœuvres et les faux-semblants… mais surtout cette impression que Copé et Fillon sont dans l’incapacité totale de renoncer à accumuler les pouvoirs, quoi qu’il en coûte. Les militants UMP -qui travaillent bénévolement, défendent leurs idées, prennent de leur temps pour faire vivre le débat public- semblent être le cadet des soucis de ces deux monstres froids. Tous les Français observent ces professionnels de la politique, richement dotés de leurs indemnités de cumulards, dépenser le produit de l’argent public qui financent les partis (parce qu’il ne faut pas oublier que c’est avec l’argent du contribuable qu’ils caricaturent la politique). L’argent public et aussi les cotisations des 300.000 militants UMP qui ne sont pas tous des emperlousés de Neuilly, mais des retraités d’Evreux, des étudiants de Lyon, des agriculteurs d’Ardèche, des petits commerçants du Raincy. Ni Fillon, ni Copé (surtout pas Copé !) ne semblent songer à lâcher prise et dire : « on va travailler ensemble mais aucun de nous deux ne peut être président dans ces conditions ». Le combat pour la conquête de l’appareil dans un parti sans culture démocratique, c’est forcément peu glorieux… ? Oui et en plus maintenant ça ne peut plus se dérouler dans l’ombre. La conquête sarkozienne du pouvoir, de la prise de la mairie de Neuilly en 83 par trahison interne au sein de la majorité municipale, à la prise de l’UMP contre ses mentors fait office d’exemple et d’épopée fantastique pour cette génération de politiciens ! Dans ce monde de voraces et de carnassiers on se gargarise de victoires internes, de triomphes d’appareil. L’époque n’est pas épique, on a les gloires, les guerres et les conquêtes que l’on peut ! Dans ce monde de « mecs qui en ont » et qui ne cèdent rien, on répète à l’envi qu’on a obtenu tout ce que l’on détient avec les dents, en se battant, en l’arrachant aux autres, de son propre camp de préférence. Jean-François Copé est maire d’une grande ville, député, chargé de faire la loi et de contrôler le gouvernement, avocat d’affaires et il veut aussi être président de l’UMP, à tout prix ! François Fillon, député qui, pour le reste de sa vie, en tant qu’ancien Premier ministre aura à disposition une voiture, un chauffeur, « un garde du corps-policier-porte valise », un bureau, et une secrétaire veut, à tout prix que Copé ne soit pas président de l’UMP. Aucun de ces deux personnages, qui ambitionnent d’être un jour Président de la république, ne semblent pouvoir simplement imaginer, s’éloigner un peu de la cagnotte, se consacrer à ses multiples mandats et fonctions, donner un peu de temps aux autres, réfléchir aux idées politiques, lire, voyager, concevoir un programme, patiemment, travailler, conceptualiser… bref se préparer à proposer une vision de la France, du monde et de l’avenir aux futurs électeurs. Non, ils semblent vouloir d’abord contrôler leur parti, maîtriser les fédérations, les réseaux, les finances, les investitures, se constituer une armée d’obligés pour paver leur route vers l’Elysée à laquelle ils pensent depuis tout petit. Cette boulimie de pouvoir d’appareil ne passe plus à l’heure de la transparence, de l’info en continu et de l’aspiration à plus de simplicité et de proximité. Finalement la plus grosse faute politique de Copé et Fillon dans cette histoire c’est d’être tragiquement, désespérément, anachroniques. Copé et Fillon se sont carbonisés, c’est le moins qu’on puisse dire. 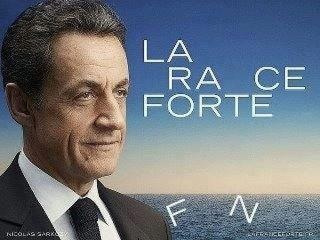 Pauvre UMP. In the past, Hamas leader Ahmed Yassin predicted Israel’s destruction by the end of the third decade of this century, and other senior Hamas figures said the next generation would be the one to witness the liberation of Palestine. Today, though, the tune has totally changed. Liberating Palestine “from the river to the sea” is portrayed as a fully realistic goal for the present generation thanks to the Islamic Spring, which has redrawn the map of the Middle East, and in light of the decisive role of the jihad-ready Muslim masses in giving the region its character. Conversely, Hamas views Israel as floundering in growing strategic distress as Turkey and Egypt become major, bitter enemies within the Arab world’s new vision of its struggle. 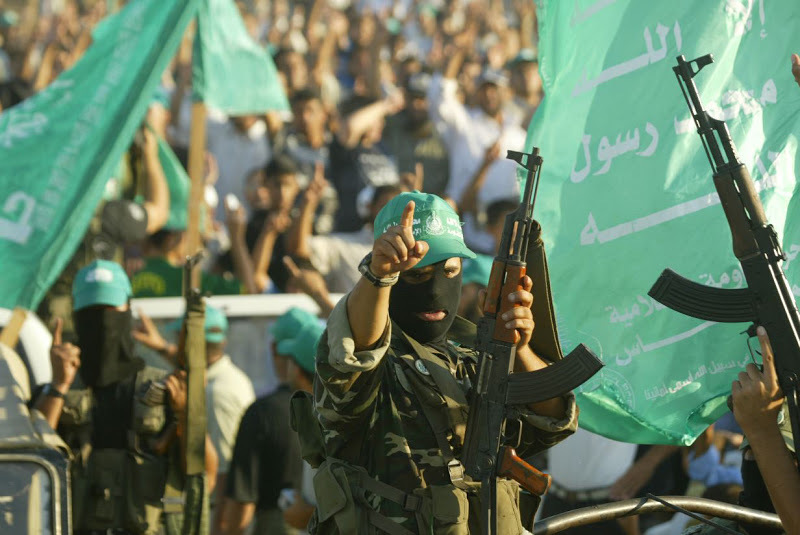 The Hamas leadership sees Israel’s political and military options, including the exercise of its right to self-defense, as increasingly limited. Although, in hindsight, Hamas made a tactical error regarding Israeli policy, its basic approach has not changed: it views each round of armed conflict with Israel as a stage in a long-term war of attrition. The increasing severity and frequency of these clashes are, then, analogous to birth pangs, with Hamas leaders hoping the violent outbreaks will eventually erode Israel’s resilience and afflict its economy. At the same time, Hamas sees these armed clashes as a means of inflaming the West Bank, thereby opening a further front against Israel and wresting rule from the Palestinian Authority. The ultimate goal is to goad the masses into more and more Islamic revolutions until the emergence of a united military front for the liberation of Palestine. Lefties and other pro-Palestinians will no doubt dismiss the JCPA as right-wing/Likudnik and linked to the Israeli security establishment—which it is—but this does not ipso facto invalidate Halevi’s argument. I will be interested to hear the reaction of pro-Pals to the report, should they deign to read it (it’s short, so they have no valid excuse not to). As for the last paragraph—on the implications for the West Bank—I think it has been clear for a while that if a Palestinian state sees the light of day before we’re all dead, the IDF itself is not going to withdraw from the WB. I’m not saying that that’s a good thing, just that that’s the way it will be. On the Israeli right, here are two depressing pieces I just read, on rising stars Moshe Feiglin and Moshe Ya’alon, who make Netanyahu look like a liberal. As with the US Republican party, it just goes from bad to worse on the Israeli right. The coming to power of Hamas in Gaza was the doing of the Bush administration and the incredible incompetence of its policy in the region: of its insistence that Hamas participate in the 2006 Palestinian elections—to which both Israel and Fatah vehemently objected (and Hamas should indeed not have been allowed to participate without explicitly endorsing all agreements signed between the PLO and Israel up to that point)—and then in hatching the botched Fatah attempt to forcibly eject Hamas in June 2007, thereby leading to the latter’s seizure of total power in Gaza. And Elliott Abrams played a central role in US policy here. Read the article and weep.